Turns out the history of Calaway Park is mired in zoning and planning disputes that date back to the late 1970s. According to their Wikipedia, the park was the idea of a former Red Deer lawyer by the name of John McAfee and a variety of other western investors. The original project cost was estimated to be $8 million but ballooned into $25 million including $3 million for the signature roller coaster. The RM of Springbank and its rural residents were worried the park would disturb their tranquil country life. But the developers persisted. Appeals were filed and land owners dug in their heels. There were additional snags with the Calgary Regional Planning Commission, which laid claim that the park would not comply with established planning documents. A citizens’ action group was formed and they pushed back at every opportunity to stop the project. The first vote to approve the park was held in October, 1979; but development didn’t start until 1982. Unfortunately, this was not the last hurdle Calaway Park would face. By the time Calaway Park opened their doors in 1982, they were faced with the reality that the city was in a recession. Rival attractions such as Calgary Zoo and Calgary Stampede could more effectively compete for the very little money folks had to spend on entertainment with their central locations. 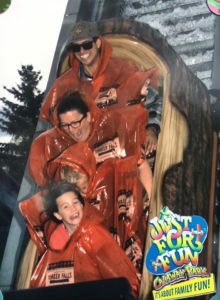 Situated 10km out of the City limits, Calaway Park touted unlimited access to all rides at a cost of $11.95 per person. Not bad considering that is close to $30 today. This wasn’t a new concept and industry attractions like Disneyland offered similar ticketing. But Canadians weren’t buying it. The original park plan featured 14 attractions within and that didn’t offer enough value to get Calgarians in the door. On top of the disappointing gate sales, the park was also hit with 17 lawsuits totalling $1 million in its first year. Developers sought help from the province but were turned away. By 1983 the park was in receivership. As a consequence, all lawsuits were stayed. The park was reformatted and rides expanded to attract older kids. Prices were cut to entice families. Northland Bank took over the park when the receivership ended in 1984 but they too could not make the park profitable. At no time did the park close, thankfully. It limped along with borrowed money from different owners and a dream to see it succeed. Developers paid Hanna-Barbera $500,000 for the rights to use the Flintstones likeness at the park. During the years it took to get approved the name changed from the Flintstones Fun Park to its present title. Though initially a neat idea, it was probably a good move on the part of developers as though Flintstones lived on for generations in syndication it ceased creating new material in 1966. Despite the name change, images of Fred and gang were apparent throughout the park in my early youth. The characters have now disappeared but the facades of some of the older buildings still reflect the cartoon imagery of Bedrock. It took over 20 years, but the park was able to expand in 2001. The park acquired five additional acres to the 160 acres Calaway calls home. Calaway Park now has 33 rides, 22 food stalls, and 27 games. There are no current attendance numbers but in 2004 there were approximately 65,000 season pass holders with approximately 500,000 people entering the gates over the season. With weather playing an important role to the success of the park, attendance can vary from year to year. This past weekend was awesome with beautiful fall weather. The park was fully decked out for Halloween with park staff festively dressed in costumes. I can report the park is in fine shape. All rides were open and buildings were well maintained with a fresh coat of paint. There aren’t any signs that the park is in any disrepair and I selfishly hope it stays this way. I will never forget my first splash on Timber Falls and you better believe I took a ride on it this weekend. My fond memories of this cool Calgary landmark remain intact.